James Wilder Jr. UDFA to Final 53? 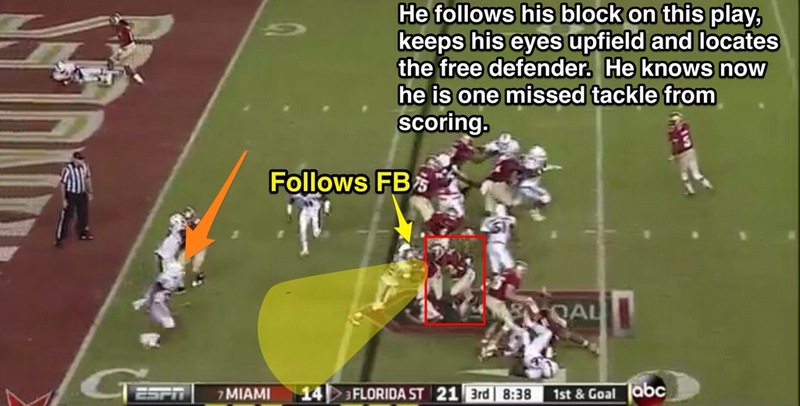 Initial Thoughts: He definitely has the talent to be on an NFL roster as the short yardage guy. The problem is for him they have a vet in BJGE they can keep in that roll with added character and leadership, even if Hill would go down. He has the look and the NFL bloodline with his dad being a former pro bowl RB with the Bucs. I see him as an insurance policy in case they lose BGJE, Hill or both in training camp or the pre-season. He will get his fair share of touches in the pre-season though. I assume the Bengals will have their mind made up on BGJE at that point and will be protecting Hill for the long haul by limiting his workload. His combine measureables are not great, but are what were expected. Chances to make the team barring no injuries in 2014 about 5%, chances for the practice squad are 100%; unless he gets arrested. Even if they let BJGE go they will likely go with Burkhead and Peerman. 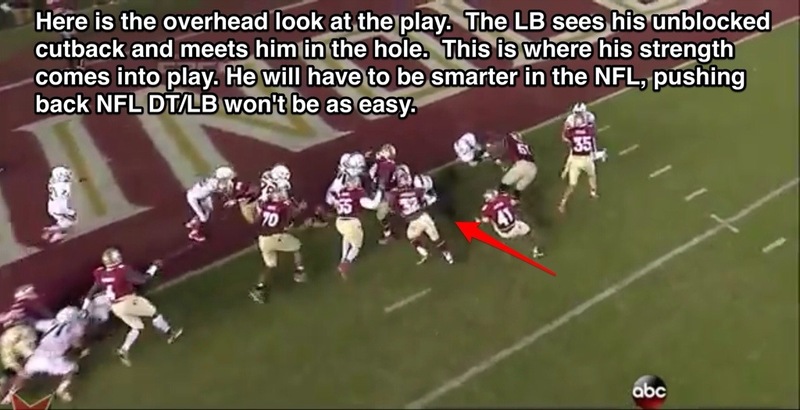 I think they see if he can keep his nose out of trouble while learning the offense in 2014. He will be the short yardage backup to hill in 2015 and I give him a 75% of making the final 53 next year. Strengths: He has the NFL back and looks the part. 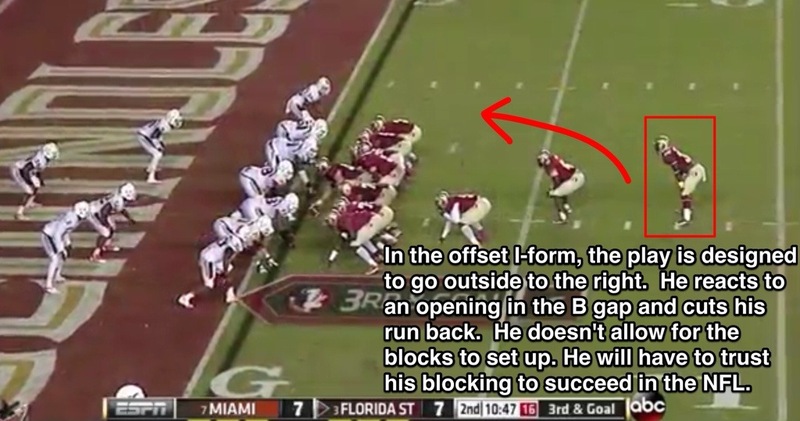 He has a strong build, and was used sparingly at FSU (only about 225 carries all time). Possesses a great stiff arm and well balanced for a guy his size. Stays behind his pads and absorbs contact well, does well at breaking tackles and getting YAC. High upside possibility and low risk for the Bengals, could be a good battering ram in the future. 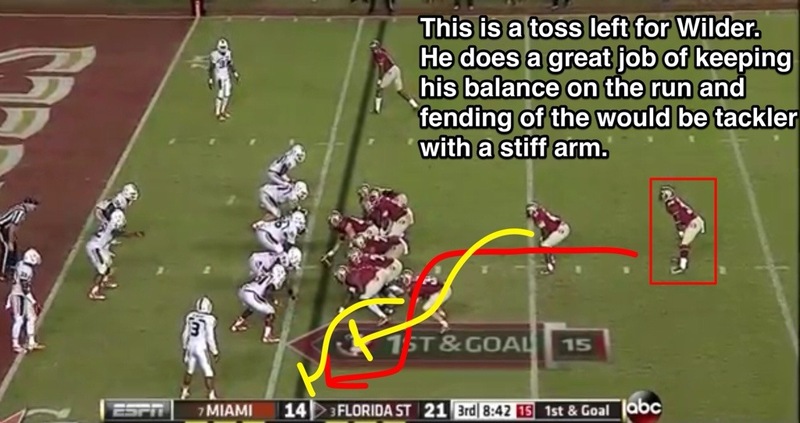 He does well at pushing the pile with his leg strength and drive. With his body type and attributes he is a perfect between the trees type of runner, when he stays north/south he excels. Averaged 7 YPC in 2013, but was stuck behind Freeman on the depth chart, who was drafted in the 4th round. Weaknesses: Not very elusive, doesn’t really have the foot speed to string moves together. This causes him to have to slow down to make his cuts, which allows him to get caught from behind at times. 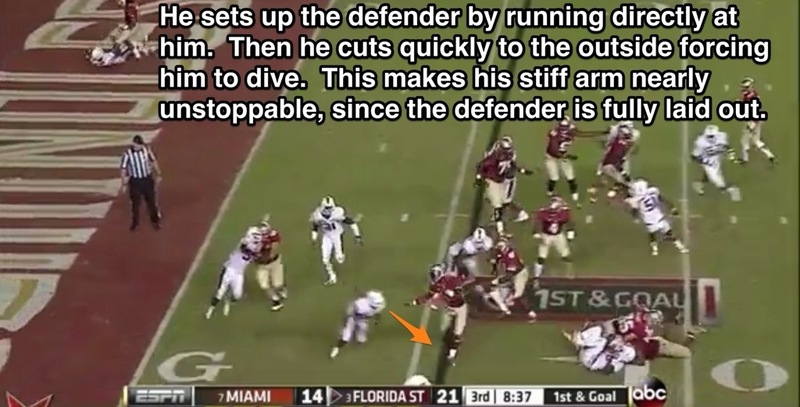 Not a shake you guy has to use the stiff arm or absort the hit and keep his feet moving to break tackles. 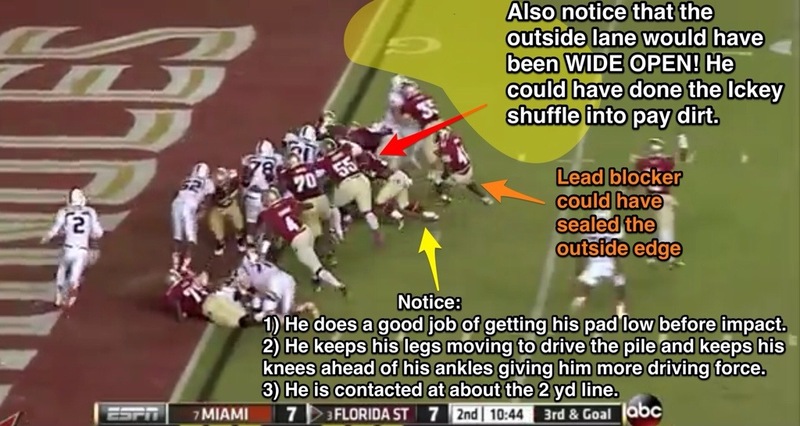 Character concerns are obvious; he was arrested multiple times at FSU. 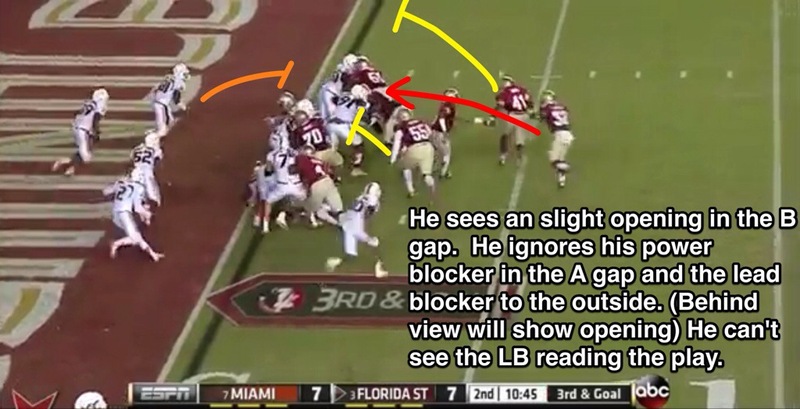 Lets his pad level get to high, running upright will cause him to get stood up in the NFL and increase his risk of injury when taking big shots to the midsection. He has had durability issues and this is the main reason. He didn’t get a pass thrown to him in the limited tape I had access too. 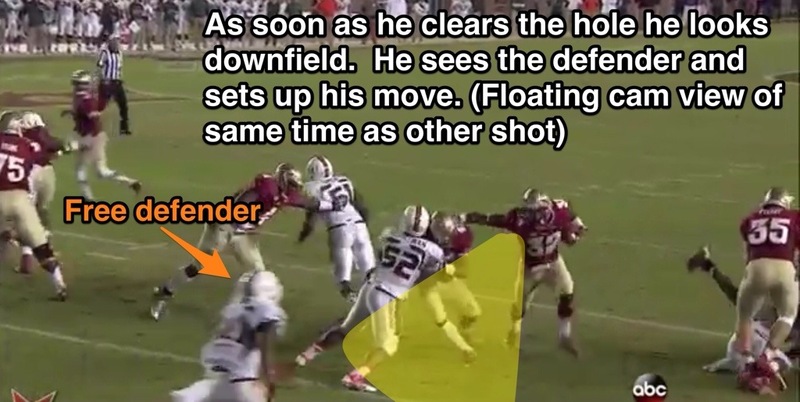 In his combine tape he chest catches almost all of the passes, when he has pads on this will certainly lead to drops. This entry was posted in Bengals, NFL, NFL Draft, Sports, Uncategorized and tagged Bengals, FSU, NFL, nfl draft on June 30, 2014 by codiki.